Nestled inconspicuously within the basement level of Cairnhill Community Club is Daily Affairs, a cosy dining space serving up a variety of Asian-Western fusion cuisine. Established since May 2017 by two home grown chefs Qihao and Jiahong, it is fuelled by their passion in infusing unique elements into dishes and curating new fusion foods, which never fails to surprise customers, and increasingly draw crowds in with their ever-changing menu prolific of creative offerings at affordable prices. The Chefs also make personal trips down to the market to source for the freshest ingredients daily, hence the availability of most dishes each day is largely dependent on the ingredients they are able to buy fresh on that day. Daily Affairs rolls out an extensive menu of dishes ranging from all-time favourites such as the Atlantic Salmon glazed with Honey Miso Marinade, Trio Mushroom Creamy Pasta, kids favourites of the familiar fish and chips, and mac and cheese, to the unique ones such as the 12-Hour Braised Beef Short Rib with Chinese Hua Diao wine. They also offer daily lunch specials at only $9.90 for a set comprising of a main, soup and drink, with a different surprise for customers each day. The 12 Hour Braised Beef Short Rib ($18) consists of a beef short rib slow cooked for 12 hours in aged Hua Diao wine, rendering the meat texture to resemble that of a braised pork belly – soft, tender, and melts in the mouth with each bite. It also boasts a sweet and savoury combination of flavours due to the sweet wine used in its cooking, as well as the addition of caramelised onions atop. 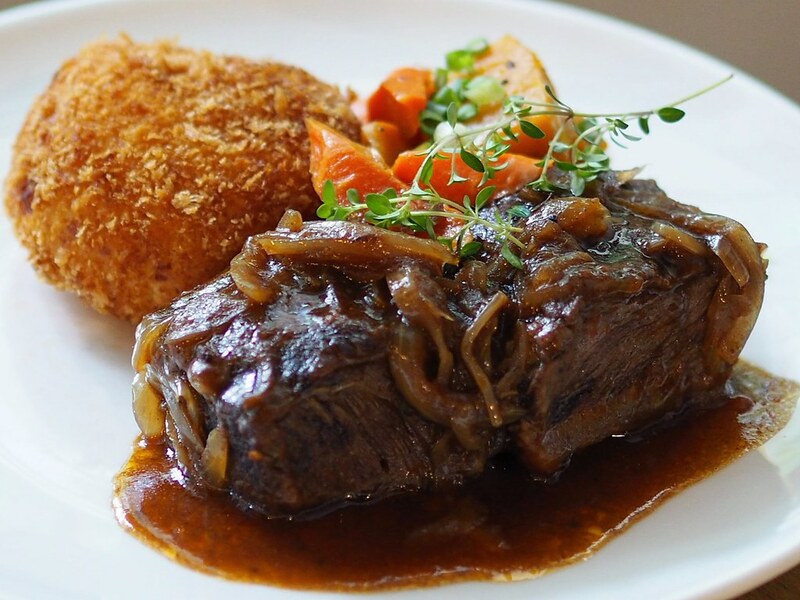 Essentially a western dish of beef short rib, yet executed perfectly with an infusion of the Asian element. The side of potato pancake boasts a fried crisp exterior and soft potato fillings to create a different mouth feel to the tender beef meat, creating a dish that not only features unique combination of flavours but also a medley of textures to continuously excite tastebuds from the first bite to the last. The main courses on the menu such as this Atlantic Pink Salmon ($15.50) comes with a side of a vegetable and a starch (choice of steamed calrose rice, sea salt fries and mashed potatoes). 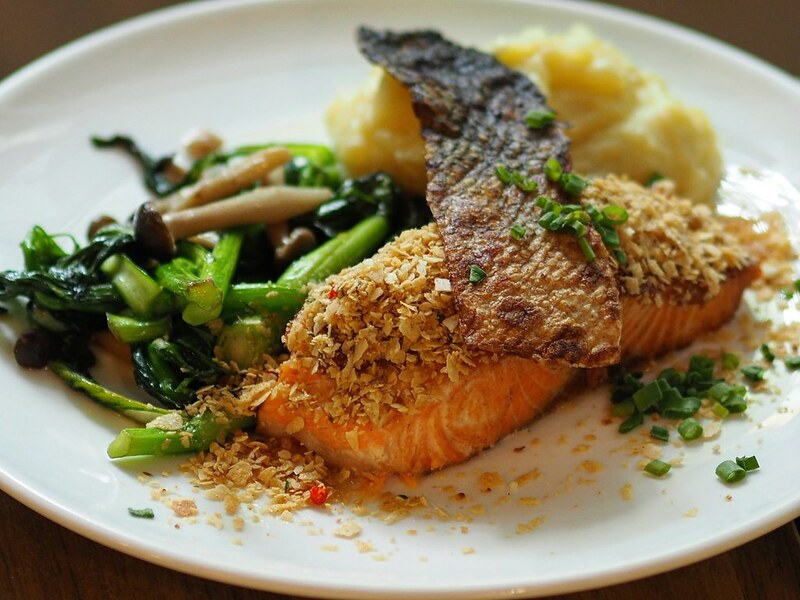 The cereals usually incorporated in the more known “creal-crusted prawn” dish was used here on the honey miso glazed salmon, soft and tender meat with a thin crisp salmon skin. Yet another well executed fusion dish with the addition of cereal and a kick of spice from the chilli padi embedded within. 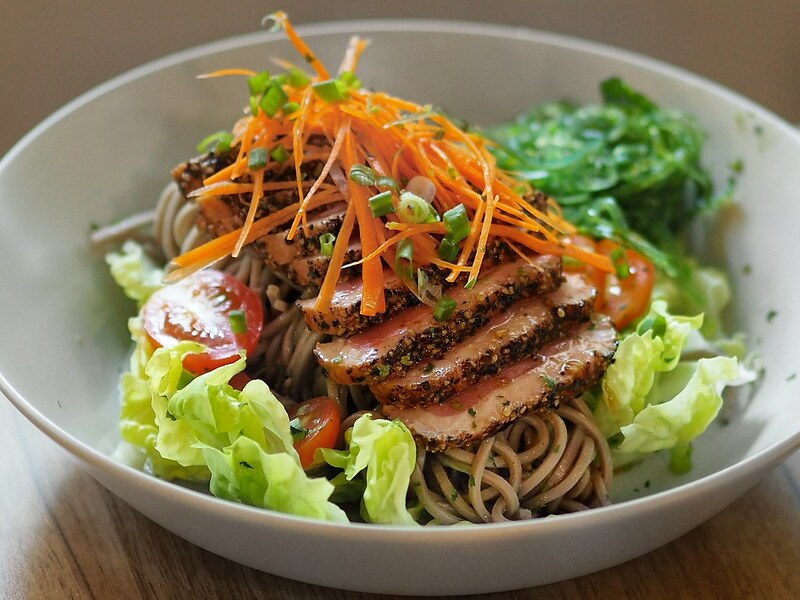 The Smoked Duck with Soba ($12.50) comes with generous slices of tender smoked duck meat on a bed of buckwheat soba and salad, with wakame and wafu dressing. The smoked duck slices add a mild saltiness to enhance the flavours of the soba and salad, with a small portion of duck fats still attached on each slice, playing out a perfect ratio balance of meat and fats. For the health-conscious, you can opt to have the duck fats removed instead. 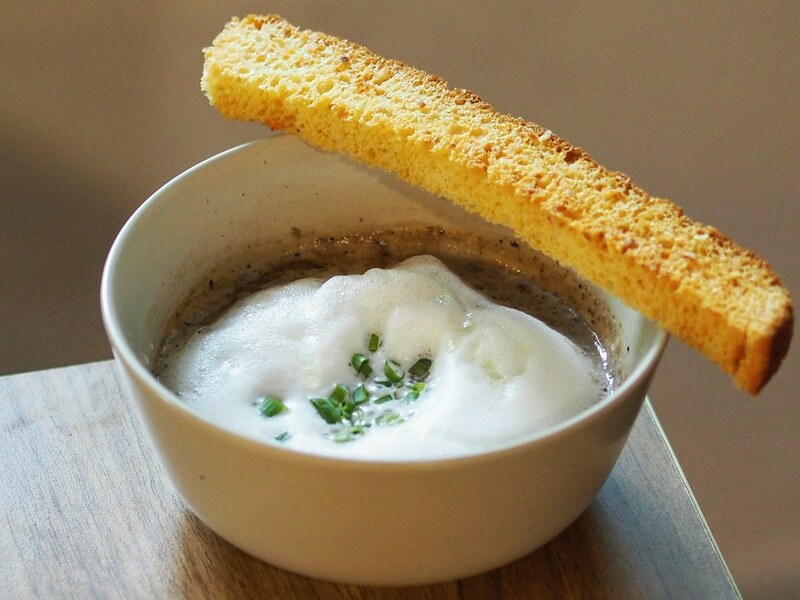 The Mushroom Cappuccino ($6) features a bowl of trio mushroom soup with truffle oil and garlic. It also comes with an extremely crispy and addictive breadstick, which was slathered with butter and toasted to a crisp texture. Dip that into the mushroom soup, and it is simply pure enjoyment. 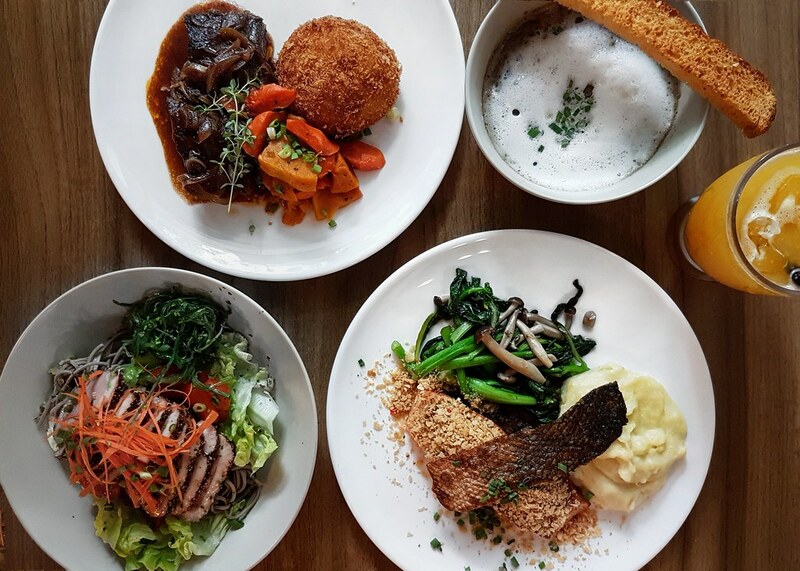 The menu at Daily Affairs undergoes constant changes and fine-tunings to bring new flavours and fusion dishes every day to surprise its customers. Barely half a year into operations and it is already drawing families and office crowds with its quality fusion fare and affordable prices despite its slightly obscure location.